The man behind last year’s Hara Hara Mahadevaki, Santhosh P. Jayakumar is now bringing us Ghajinikanth starring Arya and Sayyeshaa in lead roles. Although HHMD treaded the path of being an adult comedy, Ghajinikanth produced by Studio Green with music by Balamurali Balu looks to be a fun-filled film that will appeal to audiences of all age groups. 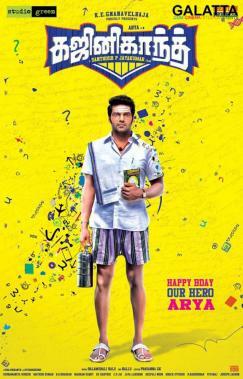 The teaser is bursting with colors and lays emphasis on Arya’s character, Rajinikanth, who apparently seems to be suffering from short-term memory loss (a condition that came under the spotlight in Suriya’s 2005 film, Ghajini). Santhanam’s narration provides an insight into Arya’s character while Sayyeshaa looks no less than a princess. We also get the hint that Sathish, Karunakaran and Motta Rajendran will be providing us with plenty of laugh riot moments when it eventually comes out in theatres later this year. Meanwhile, check out the teaser here.